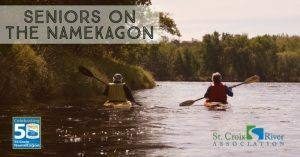 Please join Geoffrey Gates, FL Emerita who now lives in Duluth, as he leads a kayaking trip geared to seniors on the Lower Namekagon! Canoeing with a fit volunteer is, also, available for anyone who may not feel comfortable navigating their own kayak. Please see all the information by clicking the link below. Geoffrey is a volunteer with the St. Croix River Association.